Campus Alert Notification Network "CANN"
The Campus Alert Notification Network, or CANN, is a comprehensive notification structure in place to alert the campus community in the event of an emergency. Your phone or text message (participation required). www.hofstra.edu and the campus alert page of the website. An Instant Message is sent to all computers connected to the Hofstra network. The campus alert hotline: (516) 463-1234. The Hofcast network, available on LCD screens in all academic buildings, in addition to highly trafficked sites around campus. The Hofstra television service - all stations on the Hofstra service will be interrupted in case of an emergency. The Hofstra radio station - WRHU Radio Hofstra University 88.7 FM. The public address system audible alarm will only sound in the event of a real and immediate threat. For other emergencies, such as class cancellations due to snow or other severe weather conditions, the siren will not sound but all other communications channels will provide information. The public address system is controlled at the Department of Public Safety's 24-hour central command. Loudspeakers have been installed at 10 locations across campus, and are equipped to broadcast an emergency tone, other sounds or verbal instructions. The speakers on the yellow "blue light" emergency poles can broadcast information to the campus community as well. 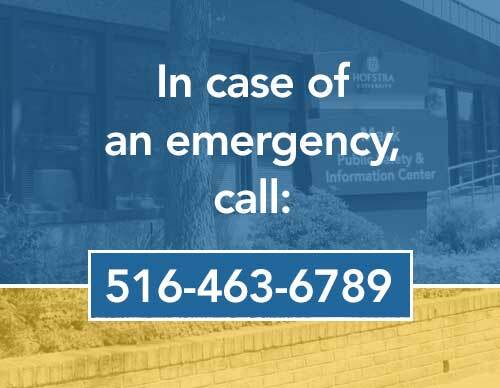 As you can see above, Hofstra utilizes a number of communication channels in case of emergency. The Hofcast network broadcasts campus events and information on a large LCD screen in more than 120 well-trafficked locations across the campus, including every academic building and each of our residence halls giving all students immediate access to emergency information on screens throughout the campus. Please visit the Hofstra Portal to update your CANN information.